Four months ago, our cameras on Cassini were commanded to execute a routine imaging sequence during an event that was anything but routine. On July 19, an array of overlapping images framing Saturn, its entire ring system and a host of its moons was acquired while Cassini was deep in the shadow created by the planet's eclipse of the Sun. This arrangement of Sun, Saturn, and machine made for a rare opportunity to image from the outer solar system the planets in close to our star. The intent: To catch a precious glimpse of our own planet ... tiny, remote, alone ... as it would be seen from a billion miles away. Images of this nature had been taken before. The famous Voyager 1990 'Pale Blue Dot' image of Earth became, in the hands of Carl Sagan, a romantic allegory of the human condition and an inspirational call to environmental protection and planetary brotherhood. 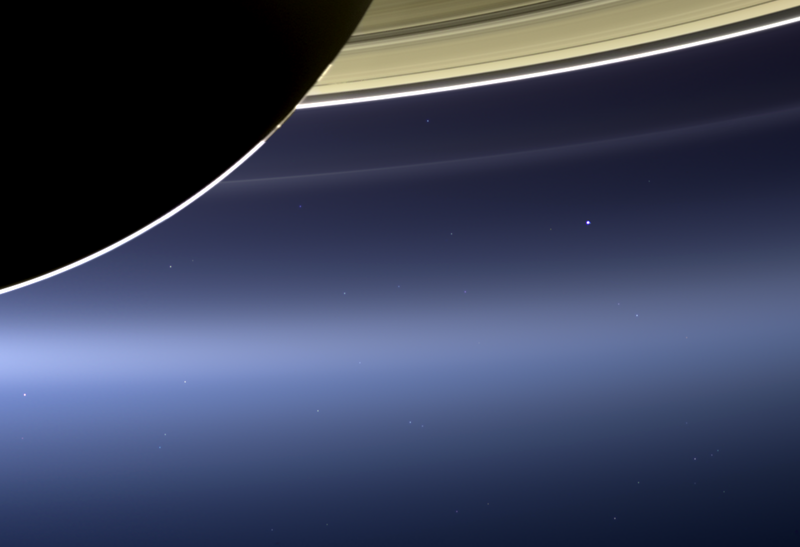 And Cassini's previous 2006 version, taken from Saturn orbit, showing the startling juxtaposition of our dot of a planet beside the enormity of Saturn's rings, became the most beloved Cassini image. But from the very start, the plans for the July 19 mosaic included something very special: If all went well, the images would capture a glimpse of Earth alongside Saturn and its rings at the very moment that people all over the globe would be contemplating their connectedness to each other and to all life on Earth, appreciating the rarity of our planet within the solar system, marveling at their own existence, and rejoicing at the very thought of having their picture taken from across the solar system. And contemplate, appreciate, marvel and rejoice they did! After much work, the mosaic that marks that moment the inhabitants of Earth, including the four above, looked up wherever they were and smiled at the sheer joy of being alive, is finally here. In its combination of beauty and meaning, it is perhaps the most unusual image ever taken in the history of the space program. Have a look and you will discover a universe of marvels. The brightly rimmed globe of Saturn and its main rings aglow with sunlight streaming through them take center stage. On the left, embedded in the enormous, gossamer blue E ring, is the brilliant moon Enceladus, gleaming in the reflected light of Saturn and the sparkle of a hundred towering geysers, and likely the most promising place in all the solar system to access alien life. A careful examination uncovers the shadow cast by this moon through the spray of smoke-sized icy particles created by those geysers, like a telephone pole might cast a shadow through a fog. Below and to the right of Enceladus is Tethys, a moon about a third the size of ours, illuminated by Saturn-shine. On the other side of the planet, to the upper right,is Mimas ... only a crescent but also casting a faint shadow through the E ring. And on it goes ... more moons and faint rings for anyone caring to take the time to wander. Now, look one more time. There, below the main rings and to the right of the globe of Saturn, far in the distance and seemingly lost in the radiance of the scene, lies a small speck of blue light, floating in a sea of stars. That is our home, with every last one of us on it ... you, me, the folks down the block, even those on the opposite side of the Earth ... we all inhabit that lovely blue dot. And more than this ... the image of that dot captures the very moment, frozen in time, when the inhabitants of our planet took a break from their normal activities to go outside and acknowledge our 'coming of age' as planetary explorers and the audacious interplanetary salute between robot and maker that this image represents. I hope long into the future, when people look again at this image, they will recall the moment when, as crazy as it might have seemed, they were there, they were aware, and they smiled. Looking in awe at these images makes me realise how tiny and insignificant the Earth is in the grand scale of the Solar System and the universe beyond. The work done by the team at CASSINI in bringing these images is nothing short of sensational. The images of the Saturn system with it's amazingly powerful atmosphere, it's majestic ring system and the myriad of sensational moons will be awe inspiring for millennia to come. I would like to thank Carolyn and the team for all their continuing efforts. The images are truly superb. I have been wondering if the sky for Titanians living on the Saturnward hemisphere ever gets dark enough to see the stars. Obviously with its current atmosphere this is unlikely but even with an atmosphere with an earthlike transparency the "full" Saturn which would dominate the night sky would be much brighter than the full moon seen from earth. Posibly during those rare times when the sun is eclipsed by Saturn the sky would be dark enough although even then twilight leaking around Saturn's atmosphere or light scattered from the rings might be enough to interfere with stargazing. I'm still interested in the possibility of a parallax image from Saturn's huge orbit. It could be of any stars that were photographed around fifteen years ago. Of course the Pleiades images would be good. It needn't be that group, though it was recently measured from Earth's orbit and a comparison with the Saturn orbit would move astronomy to a whole new scale. Why do the rings not match up where they cross the face of Saturn? Why is the face of Saturn not completely black? What is the bright line around most of the rim of Saturn? Why is there a black band outside the upper half of the bright ring? The difference from Voyager's "pale blue dot" and the Cassini photo of Earth is that with Cassini we have a strong perspective of scale with the rings of Saturn. Thus giving us a the "neighborhood effect" from one neighbor of the solar system looking out the kitchen window, if you will, to another across the backyard of space. Always in awe of Carolyn's work. 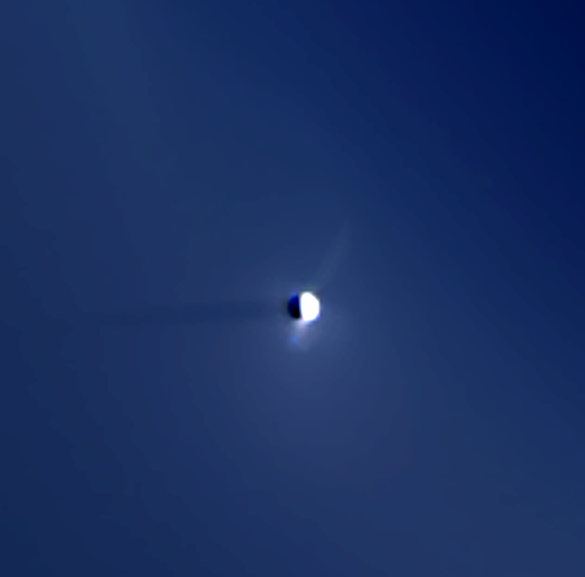 How in the shadow of Saturn bright ring image is overlaped? As inspiring as the imaging is, I have to admit my first feelings were not of the awe most embraced. 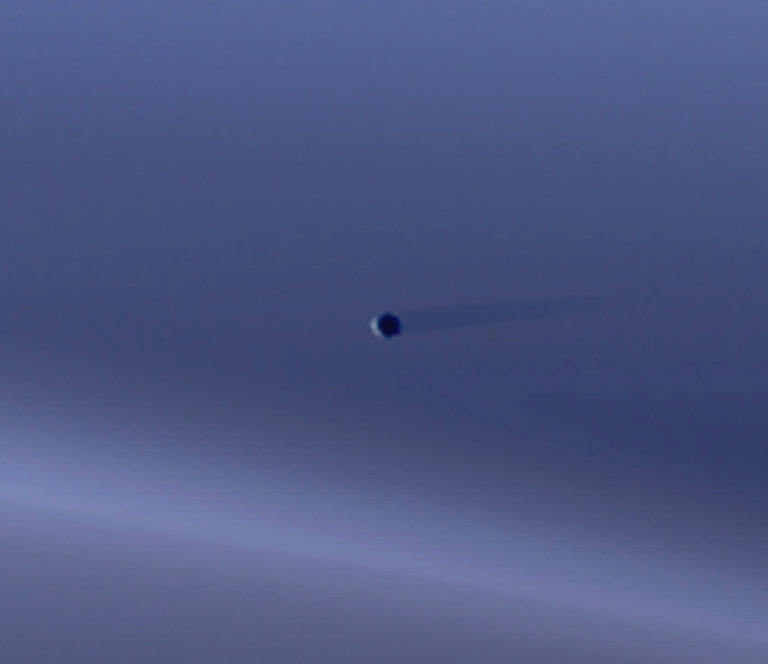 Gazing at the tiny blue dot, against that vast black void all around it, I realized that we are a rather tiny target. Military training teaches to present the smallest target possible. Earth, our home, is doing it very well. Not perfect, but very very well. That, inspires great happiness in me. As I may add also, when you enlarge the blue dot, our moon is at 4 o'clock as it beams with her mother-blue dot to get picture taken by Cassini as well. What an amazing spectacle! We all became part of history as we glimpse the sky; the moment imprinted an event as Cassini carefully recorded in its database this blue dot we call home. An astounding enhancement of an embodiment in the universe; pictured by a human crafty handiwork called Cassini. Congratulations to you Carolyn and your team for a well-deserved accomplishment!